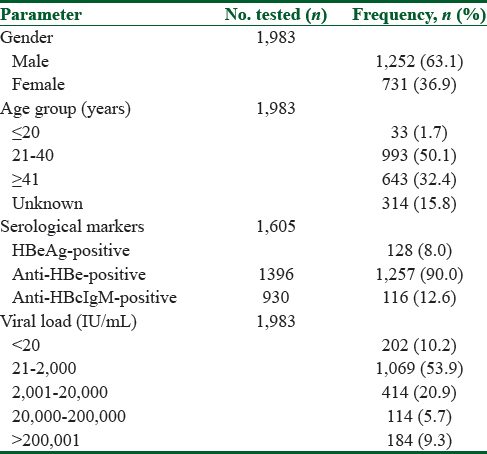 Hepatitis B surface antigen (HBsAg) is the hallmark of hepatitis B infection and the first serological marker to appear in acute hepatitis B infection in association with hepatitis Be antigen (HBeAg) and hepatitis B core antibodies of the IgM subclass (HBcore IgM)., In sub-Saharan Africa and Asia where hepatitis B is endemic, persistence of HBsAg for years and decades is a common complication of perinatal and childhood infections., The hepatitis B viral genome (HBV DNA) is the most reliable marker of active viral replication and correlates with the level of circulating viral particles. It can be detected in blood and quantified in serum using molecular assays., The accurate evaluation of these markers in combination with clinical assessment and liver enzyme estimation enables evaluation of natural history and individual risk of progressive liver disease and forms the basis of international and local HBV treatment guidelines., However, the limited availability of serological and molecular testing constitutes one of the most important barriers to treatment evaluation of viral hepatitis in resource-limited countries and may hinder the attainment of global viral hepatitis control (WHO 2017). This study was performed at a national reference laboratory with the main aim of evaluating the serological status of HBsAg-positive patients and the level of HBV DNA viremia and thus providing a better understanding of the natural history of hepatitis B and the identification of those who may require antiviral therapy. This is a retrospective study performed at the Human Virology Laboratory (HVL) of the Nigerian Institute of Medical Research (NIMR), Lagos. This national reference laboratory was established in 2001 and it receives plasma samples from all regions of the country for serological and molecular evaluations for viral hepatitis. HVL implements quality management system and is certified by the International Organization for Standardization (ISO) 9001:2008 and has been recently accredited to ISO 15189:2012 by the South African National Accreditation System. Data abstracted for this study were from HBsAg-positive patients ≥13 years of age referred from public and private health facilities for diagnostic testing between January 2011 and December 2016. Demographic, serological, and virological data were delinked from subjects' identity to ensure confidentiality. HBV viral load quantification was done for all subjects; however, the evaluation of serological markers differed based on the request by referring physician. Serological tests for hepatitis B antigens (HBsAg, HBeAg) and antibodies (anti-HBcore IgM, anti-HBeAb) were performed by enzyme immunoassay technique (DIA.PRO; Diagnostic BioProbes Srl, Italy). The concentration of the specific antibody–antigen complex in the sample was determined by means of a cut-off value that allowed for the semi-quantitative detection of the analyte according to the manufacturer's instructions. HBV viral load was done using COBAS AmpliPrep/COBAS TaqMan 48HBV Test, version 2.0 (Roche Diagnostics, Switzerland) for automated amplification and detection with a limit of detection of 20–170,000,000 IU/mL. Specimen preparation and simultaneous polymerase chain reaction (PCR) amplification of target DNA was performed followed by detection of cleaved dual-labeled oligonucleotide detection probe specific to the target according to the manufacturer's instructions. Quantitative HBV viral load levels exceeding 2,000 IU/mL was considered high-level HBV replication, whereas levels below 2,000 IU/mL were low-level replication. An undetectable viral load was defined as HBV DNA below the level of sensitivity of the assay (<20 IU/mL). Statistical Package for Social Sciences (SPSS) program version 20 software was used for data analysis involving summary statistics. T-test and analysis of variance statistics were used to determine test of significance. P value <0.05 was considered as significant. Ethical approval for this study was obtained from the NIMR Institutional Review Board. During the 6-year period, a total of 2,100 subjects with HBV infection were reviewed and their data abstracted. Data analysis was conducted only on 1,983 subjects with HBV viral load results. 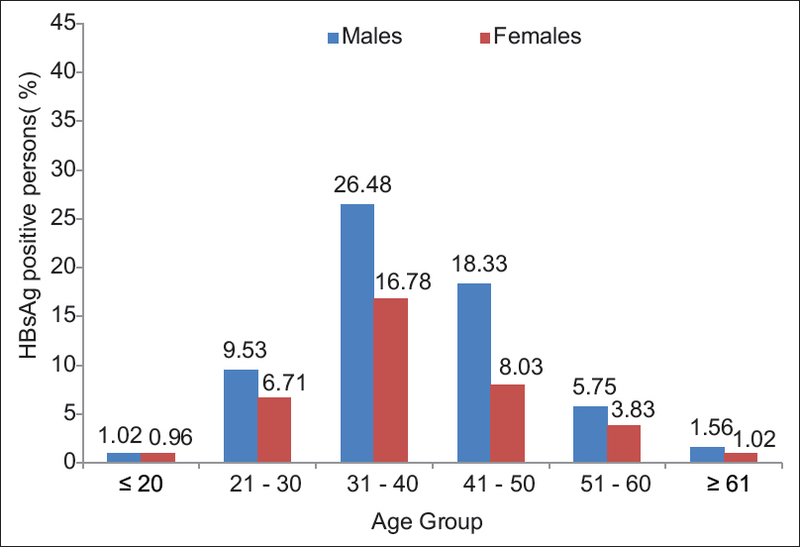 There were 1,252 (63.1%) males and 731 (36.9%) females [Table 1] with a male-to-female ratio of 1.7:1. The mean age of the study population was 38.4 ± 10.4 years (range: 13–65 years). The highest seroprevalence of HBsAg was noted in subjects 31–40 years of age and declined with advancing age [Figure 1]. Overall, HBeAg was detected in 8.0% (128/1,605) of subjects, anti-HBe was positive in 90.0% (1,257/1,396), while HBcore IgM was detected in 12.6% (116/930) [Table 1]. Although detectable viral DNA (≥20 IU/mL) was identified in 1,781 (89%), high-level viral replication with HBV DNA exceeding 2,000 IU/mL was seen in a total of 712 (35.9%) subjects. [Table 2] shows the distribution of age and viral markers according to HBeAg status of the patient. HBeAg-positive patients (119 of 1,540) were significantly more likely to be <40 years of age compared with HBeAg-negative subjects [odds ratio (OR) = 2.29, P = 0.0002]. Among 589 patients with both HBeAg and anti-HBcore IgM test results, HBeAg-positive subjects were significantly more likely to have acute infection based on the presence of HBcore-IgM-positive [25 (46.3%)] compared with HBeAg-negative patients [56 (10.5%)], OR = 7.4, P < 0.00001. Anti-HBe was significantly more frequent in HBeAg-negative compared with HBeAg-positive subjects (96.4% vs 22.1%, OR = 0.01, P ≤ 0.0001). The relationship between HBV DNA viral load and HBeAg status is shown in [Table 2]. Low replicative HBV viral load occurred more frequently in HBeAg-negative patients [1,003 (67.9%)] than in HBeAg-positive patients [25 (19.5%)]. HBV DNA replication between 20,0001 and 200,000 and levels >200,000 IU/mL were more frequently detected in HBeAg-positive subjects (9.4% and 65.7%) compared with HBeAg-negative subjects (5.1% and 4.9%), respectively, P < 0.0001 in both categories. Although new infections in the perinatal and childhood period constitute the most important route of transmission in endemic regions, our finding suggest that new infections occur in a minority of adults. While mostly unrecognized and underestimated in the community, it may represent an important route of sustaining hepatitis infection even in endemic regions., This finding underscores the need to strengthen injection safety and vaccination services in susceptible adolescent and adult populations, so as to achieve national hepatitis control and global elimination. The role of unsafe injection and sexual transmission as important routes of adolescent and adult transmission requires further evaluation. Most of the study subjects were in a low replicative phase of chronic hepatitis B characterized by HBeAg-negative status, detection of HBe antibodies (anti-HBe), and DNA concentration below 2000 IU/mL. In the absence of corresponding liver injury and normal liver aminotransferase enzyme, these subjects are considered as chronic inactive carriers. Antiviral therapy is not recommended in these carriers due to the low risk of disease progression., It is, however, notable that one-third of subjects who were HBeAg-negative had a high-level HBV replication despite detectable anti-HBe antibodies. This finding has been termed HBeAg-negative hepatitis and is the predominant form of chronic hepatitis B–associated liver disease in Asia and sub-Saharan Africa.,,, The distinction between chronic inactive carriers and patients with HBeAg-negative disease has a decisive impact on patient care decisions. The active viral replication in the latter represents the strongest single predictive biomarker associated with disease progression and is attributed to the activity of HBV viral mutations that replicate aggressively without generating the HBe antigen., Patients with HBeAg-negative disease require treatment evaluation and may require antiviral therapy for disease control. In a large community hepatitis B survey in the Gambia, West Africa, most people with hepatitis B infection had detectable viral load and viral profiles consistent with chronic inactive carriers. Although our findings are consistent, we report a significantly higher prevalence of HBe-negative disease in more than 30% of the Nigerian subjects compared with 10.7% in the Gambia population study. One reason for these differences may be related to the subjects studied. It is plausible that our subjects had higher viral loads because they were hospital-based patients and thus more symptomatic than the community population in Gambia. Another important reason may be the different molecular assays used to quantify viral DNA. In support of our study, the standard Roche Amplicor molecular assay used for viral detection and quantification is internationally regulated and associated with a high level of sensitivity and specificity heightening the validity of our finding. There are several limitations to our study. The underlying clinical patient status was unknown. In addition, although anti-HBcore IgM is characteristically associated with new or acute hepatitis B infections, lower titers have been detected in episodes of chronic hepatitis B reactivation. Despite these limitations, our study is unique and represents the largest study of HBV viral load estimation using PCR molecular technology in this region. In addition, the implementation of quality management system and international accreditation of the reference laboratory enhances the confidence of our data. There, however, remains a need for a larger prospective study with both clinical evaluation and biochemical testing to fully explore the natural history and phases of infection in Nigerian subjects with HBV infection. In conclusion, we have demonstrated the predominance of low replicative HBV infection in patients with hepatitis B infection and presence of HBeAg-negative infection with significant viral loads in one-third of infected hospital patients. Our findings have implications for the planning of national hepatitis programs and provision of treatment and follow-up services. HBeAg-positive infections were uncommon, but occurred more commonly in younger adults with new or acute infections, and highlight the need for improved vaccination services in susceptible adolescent and adults. Federal Ministry of Health. National Survey of Viral Hepatitis B and C Infection in Nigeria; 2013. Iloeje UH, Yang HI, Su J, Jen CL, You SL, Chen CJ. Predicting cirrhosis risk based on the level of circulating hepatitis B viral load. Gastroenterology 2006;130:678-86. Ott JJ, Stevens GA, Groeger J, Wiersma ST. Global epidemiology of hepatitis B virus infection: New estimates of age-specific HBsAg seroprevalence and endemicity. Vaccine 2012;30:2212-9. Kao JH. Diagnosis of hepatitis B virus infection through serological and virological markers. Expert Rev Gastroenterol Hepatol 2008;2:553-62. Merican I, Guan R, Amarapuka D, Alexander M, Chutaputti A, Chien R, et al. Chronic hepatitis B virus infection in Asian countries. J Gastroenterol Hepatol 2000;15:1356-61. Kirk GD, Lesi OA, Mendy M, Akano AO, Sam O, Goedert JJ, et al. The Gambia Liver Cancer Study: Infection with hepatitis B and C and the risk of hepatocellular carcinoma in West Africa. Hepatology 2004;39:211-9. World Health Organization 2015. Guidelines for the prevention, care and treatment of persons with chronic hepatitis B infection. Available from: www.who.int/hepatitis/publications/hepatitis-b-guidelines/en/. [Last assessed 2017 Aug 29]. World Health Organization (WHO). Global Hepatitis report 2017. Available from: www.who.int/entity/hepatitis/publications/global-hepatitis-report2017/en/- 30k. [Last accessed on 2017 Sep 4]. Kolou M, Katawa G, Salou M, Gozo-Akakpo KS, Dossim S, Kwarteng A, et al. High prevalence of hepatitis B virus infection in the age range of 20-39 years old individuals in Lome. Open Virol J 2017;11:1. Kew MC. Epidemiology of chronic hepatitis B virus infection, hepatocellular carcinoma, and hepatitis B virus-induced hepatocellular carcinoma. Pathol Biol 2010;58.4:273-7. Baig S. Gender disparity in infections of hepatitis B virus. 2009. J Coll Physicians Surg Pak. 2009;19:598-600. Krogsgaard K, Kryger P, Aldershvile J, Andersson P, Brechot C. Hepatitis B virus DNA in serum from subjects with acute hepatitis B. Hepatology 1985;5:10-3. Li Z, Hou X, Cao G. Is mother-to-infant transmission the most important factor for persistent HBV infection? Emerg Microbes Infect 2015;4:e30. Andersson MI, Rajbhandari R, Kew MC, Vento S, Preiser W, Hoepelman AI, et al. Mother-to-child transmission of hepatitis B virus in sub-Saharan Africa: Time to act. Lancet Glob Health 2015;3:e358-9. Jardi R, Buti M, Rodriguez-Frias F, Cortina M, Esteban R, Guardia J, et al. The value of quantitative detection of HBV-DNA amplified by PCR in the study of hepatitis B infection. J Hepatol 1996;24:680-5. Funk ML, Rosenberg DM, Lok AS. Worldwide epidemiology of HbeAg negative chronic hepatitis B and associated precore and core promoter variants. J Viral Hepat 2002;9:52-61. Hadziyannis SJ, Vassilopoulos D. Hepatitis B e antigen-negative chronic hepatitis B. Hepatology 2001;34:617-24. Yang H, Lu S, Liaw Y, You SL, Sun CA, Wang LY, et al. Hepatitis B e antigen and the risk of hepatocellular carcinoma. N Engl J Med 2002;347:168-74. Iregbu KC, Nwajiobi-Princewill PI. Viral load pattern among hepatitis B surface antigen-positive patients: Laboratory perspective and implications for therapy. Ann Med Health Sci Res 2016;6:95-9. Lemoine M, Shimakawa Y, Njie R, Taal M, Ndow G, Chemin I, et al. Acceptability and feasibility of a screen-and-treat programme for hepatitis B virus infection in The Gambia: The Prevention of Liver Fibrosis and Cancer in Africa (PROLIFICA) study. Lancet Global Health 2016;4:e559-67.